Architects are forever pushing the boundaries of design to create spectacular, astonishing, or just plain weird-looking buildings to catch your eye. We’ve found a plethora of these deranged designs across Europe on Google Street View and on Yandex Maps Panorama; below are ten of our favourites! No, no one slipped something into your drink, and your brain isn’t melting, either. 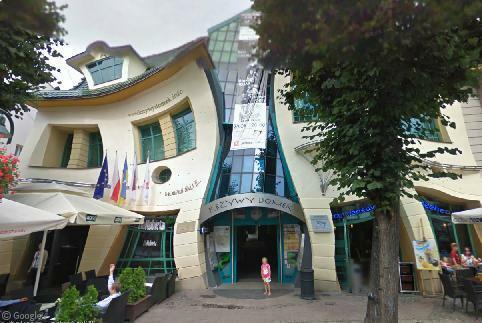 This is the Krzywy Domek (Crooked House), built in 2004 as part of the Rezydent shopping centre in Sopot, Poland. Inspired by the surreal fairytale drawings of Polish illustrator Jan Marcin Szancer, Krzywy Domek is home to office space on its top floor and numerous restaurants and drinking establishments at ground level, which are probably fantastic places to celebrate one of your 364 unbirthdays each year. 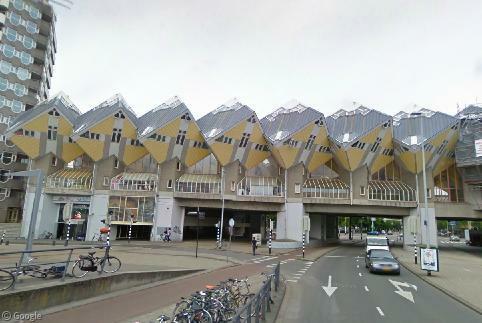 In the Dutch cities of Rotterdam and Helmond stand the Kubuswoningen, literally ‘cube houses’. Designed by architect Piet Blom and based on the concept of ‘living as an urban roof’, the Kubuswoningen are compact houses in the shapes of cubes tilted 54.7 degrees and rested upon hexagon-shaped pylons. Each cube house contains three stories, but because of the tilted walls only three-quarters of the space in each house is usable. The Rotterdam complex contains 39 houses; the Helmond complex contains 18. 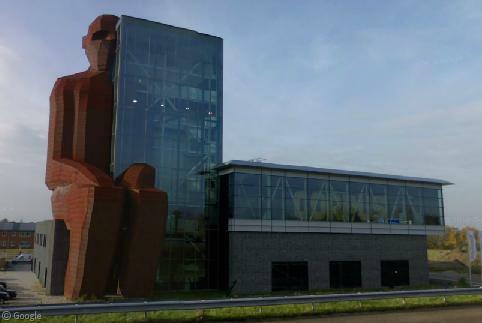 Speaking of the Netherlands, outside the city of Oegstgeest is the Corpus museum. Dedicated to human biology, the Corpus building is even weirder inside than it is outside. As if standing inside of a building shaped like a human body wasn’t odd enough, the museum tour begins with an escalator ride into an open sore on a giant knee and carries on through such scintillating exhibits as watching live cheese digestion and a 3D sperm-egg fertilisation hologram. Kids can even jump up and down on the body’s giant tongue, which doubles as a trampoline. Frank Gehry1, the architect who designed the Dancing House in Prague, was also responsible for the striking Guggenheim Museum Bilbao2. Hailed as one of the greatest architectural achievements of the past 25 years, the 32 500 m2 (349 800 sq. 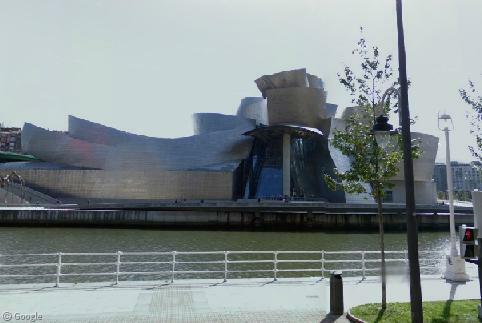 ft.) art museum is built of stone, glass, and titanium and sits along the Nervión River. 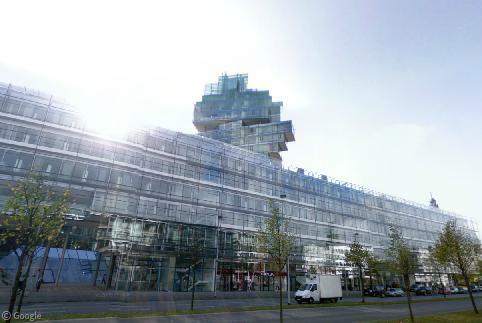 The headquarters of the German bank Nord/LB in Hanover was once referred to as ‘a stack of containers’ thanks to the very abstract shape of its 70 m (230 ft) office tower. The sheer glass structure ensures that much of the giant building can be lit purely by natural daylight. 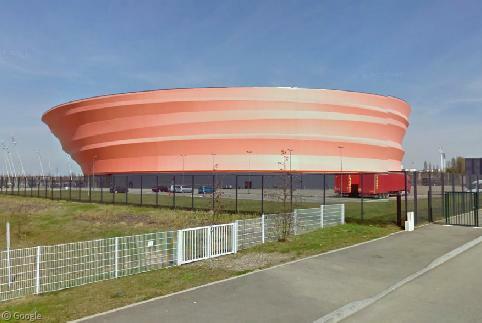 Appearing much like a spring being squashed by an invisible foot or a plastic bowl that got warped in the microwave, Strasbourg’s Zénith de Strasbourg sporting arena was completed in December 2007. With a design meant to mimic that of Aladdin’s lamp, the skewed 12,000-seater is constructed of five ellipsoidal steel rings wrapped around a concrete core and covered in a translucent orange fibreglass/silicone membrane stitched together from 40 separate massive pieces of fabric. In Lviv, Ukraine stands the Crossword Tower, an apartment building plastered with a 30 m (100 ft) tall crossword puzzle. Installed in 2009, the crossword produces an interactive adventure for visitors to Lviv as the questions for the puzzle’s clues are located in different point of interests around the historic city. After visiting the various attractions, visitors can return to the tower at night to check the answers, which are painted in the squares in special glow-in-the-dark paint. 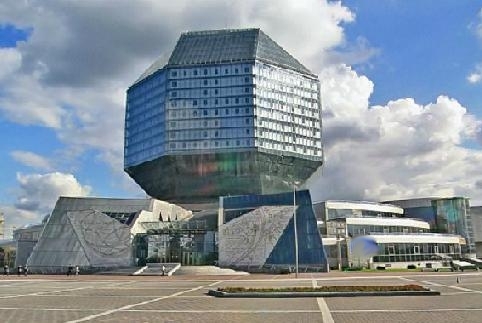 The National Library of Belarus is perhaps the most famous building in the world that can claim to be built in the shape of a rhombicuboctahedron, with eighteen square faces joined by eight triangular faces. Built in 2006, the library has 8 million items, can hold 2,000 readers at once, and has a 500-seat conference hall. Any guesses as to what this strange silver tube is? 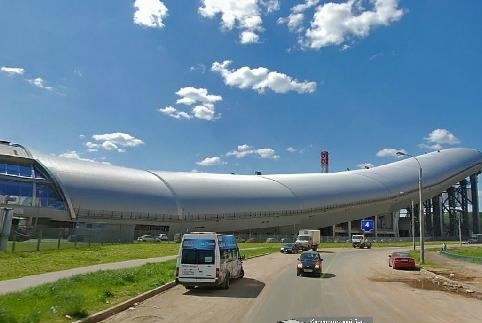 Behold Snej.com, Russia’s only indoor ski park, located in the Moscow suburb of Krasnogorsk. It may be summer on the outside, but it’s winter on the inside. After all, why not build an artificial ski hill in a city that already has five months of winter each year? 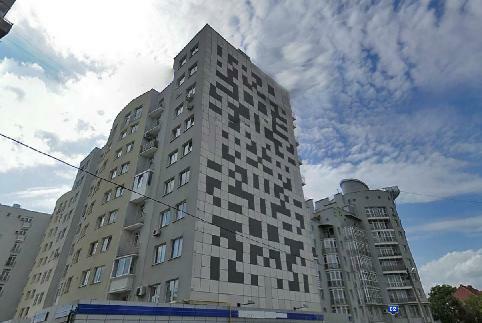 Finally, in St. Petersburg we came across this building with walls built in the shape of a UPC barcode. 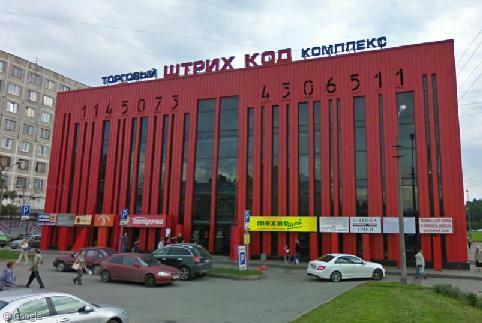 Known as Shtrikh Kod in Russian, the architectural firm Vitruvio & Sons built this edifice in 2007. Perhaps unsurprisingly, it’s a shopping and office complex. The numbers in the code actually double as sixth-floor windows. Of course, if they really wanted to be clever, they could have built the place in the shape of a QR code. Know of another crazy European building that you think should have been included in this list? Please leave a comment to let us know! Fabulous post, Kyle! I want to go and do the crossword… but I’m guessing it’s not in English. It’s awesome that you title a picture “Dancing House” in Prague and the picture itself is the Guggenheim Museum in Bilbao. In the Netherlands, there’s also the ‘bollenveld’, a ‘field’ of ‘ball-shaped houses that each reside on a stick’. Bollenveld, the street’s name, translates (freely) to ‘field of balls’. Experimental architecture in the city of ‘s Hertogenbosch (or in short: Den Bosch).